Montreal has won all three games against Boston this season. BOSTON — Montreal winger Max Pacioretty had a simple explanation for why the Canadiens have had so much success lately against the Boston Bruins. They play just like them. Carey Price made 33 saves, Tomas Plekanec had a goal and an assist, and Montreal beat the Bruins 2-0 on Saturday night. 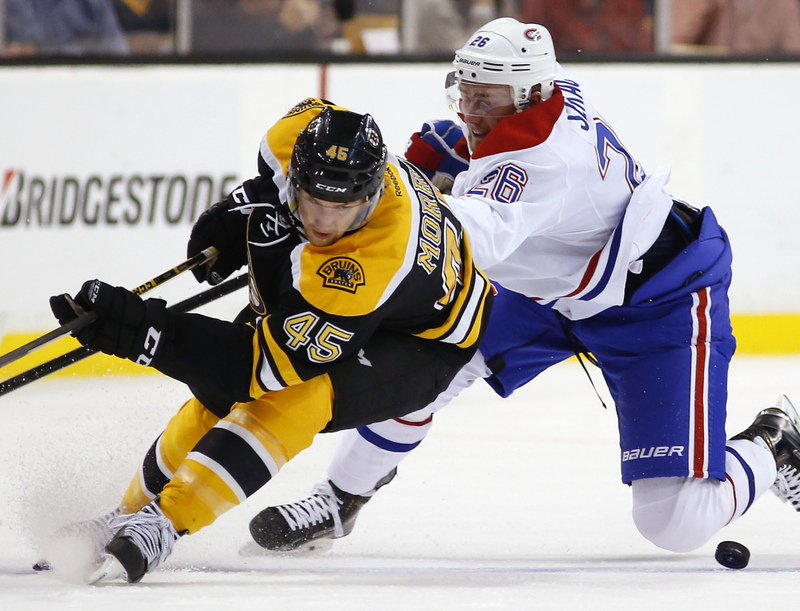 The Canadiens improved to 9-1 in their last 10 regular-season games against the Bruins. That doesn’t include ousting them from last year’s Stanley Cup playoffs. Andrei Markov added his 100th career goal for the Canadiens, who posted their eighth win in nine games. Solid defense in front of Price and tight checking helped Montreal raise its mark to 3-0 against Boston this season. “I put a lot of trust in guys around me to do their job and it simplifies my game,” said Price, who was tested with very few tough shots. Tuukka Rask stopped 22 shots but feel to 3-12-3 in his career during the regular season against the Canadiens. The Bruins were missing a number of key players: Zdeno Chara, David Krejci and Brad Marchand are out with injuries. It was the 728th regular-season meeting between the clubs, the first in Boston since Montreal upset the top-seeded Bruins in a seven-game series last spring in the Eastern Conference’s second round. “When you play a team that’s healthy and that’s going extremely well, it almost takes a perfect game,” said Boston Coach Claude Julien, who was behind the bench for his 800th career game. SABRES 2, CAPITALS 1: Torrey Mitchell scored the tiebreaking goal with 7:42 left, Jhonas Enroth stopped 43 shots, and Buffalo won at Washington for the Sabres’ third straight victory. ISLANDERS 4, PENGUINS 1: Anders Lee scored the go-ahead goal early in the third period, Jaroslav Halak made 27 saves and the New York Islanders beat Pittsburgh at home to sweep a home-and-home series. LIGHTNING 2, WILD 1: Steven Stamkos scored his 14th goal of the season and host Tampa Bay snapped Minnesota’s four-game winning streak. PREDATORS 3, PANTHERS 2: Filip Forsberg scored the lone goal in a shootout, and host Nashville beat Florida after squandering a two-goal lead in the final minute of regulation. FLYERS 4, BLUE JACKETS 2: Brayden Schenn, Mark Streit, Wayne Simmonds and Braydon Coburn all scored for Philadelphia, which broke a season-worst, four-game losing streak with a victory at home. BLUES 3, SENATORS 2: Alex Steen’s second-period goal stood up as the game-winner as St. Louis won at Ottawa. MAPLE LEAFS 4, RED WINGS 1: Tyler Bozak scored a pair of third-period goals, and Toronto won at home. STARS 5, KINGS 4: Jamie Benn scored two first-period goals, and Dallas won at home.